Free download Shock Troopers PC Game. It is an arcade game developed by Saurus for neo geo platform. 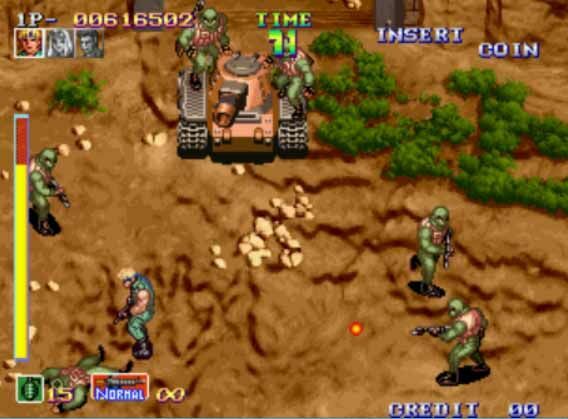 Shock Troopers game was published by SNK in late 90s. You can play Shock Troopers game on your PC by downloading from this website. There is another game with name Shock Troopers 2nd Squad in this series. Shock Troopers PC Game is very easy to download and play. There is no need to install this game on your PC. You have to download the compressed folder from the download link given below. After that, extract the folder and start to play the game according to playing method given below. In Shock Troopers game, there are two modes of game. These modes are Lonly Wolf and Team Battle. You can select any mode to play the game. After that, you have to select your player. There are eight players and you can select any of them according to your choice. After that, you have to select the route from Mountain, Jungle and Valley. After that, you are ready to play the game. You can move your player in 360 degree and can fire all way. You have to destroy tanks and different obstacles. It is difficult to fire and aim because your player will start to move the direction of your aim. Try and enjoy the game.